The Special Collections room houses rare, foreign, and antiquated books. “Special Collections” is an umbrella term used at Preus Library for materials located in areas of the library that are typically outside of or separate from the main collection. Materials in Special Collections do not circulate and are segregated from the main collection in closed stack areas to which there is no public access. Most of the materials are cataloged and can be found on WorldCat Discovery, the online catalog. Areas included in Special Collections are the Alumni, Faculty/Staff, Luther College Press collection, the DEPO collection, and the Rare Book collection. Two adjunct assemblages of materials related to Special Collections, administered under the aegis of the library, should also be mentioned. The Luther College Archives collects and makes available records of enduring value, focusing principally on the College. The Fine Arts Collection comprised of the visual art owned by the College, is supplemented by extensive documentation maintained on the art and artists represented in the collection. What are some highlights in Special Collections? Materials in Special Collections have originated from a variety of sources. A number of works are considered “special” and part of a “collection” when they have been cataloged to show a common attribute. The most typical example of such material would be a collection (such as books, periodicals, recordings, etc.) donated by a common donor. Another example would be a collection of material designed and published by a well-known printer such as the Roycrofters Press. Many items assigned to Special Collections in Preus Library have been transferred from the main collection after review and evaluation. Numerous core materials from the beginning days of the library at the College have been placed in Special Collections, although some remain in the main library collection. Early Luther College student organizations donated a number of works to the college library from their private libraries when they dissolved. These books or periodicals had been purchased with their own funds. Mimer – Begun in 1873 as a reading society and dissolved in 1889 when 900 books were absorbed by the college library. The catalog of this collection indicated the books were mostly standard works of English, American, and Norwegian literature with some books focused on history and the natural sciences. Normannalaget – Organized in 1892 to be a Norwegian literary society but ended temporarily in 1918. It was reorganized in 1925 and lasted another four or five years. 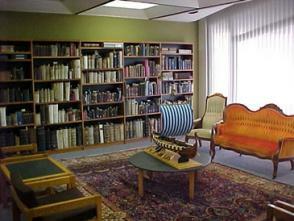 The society donated its collection of 150 volumes of Norwegian literature to the library. P.A. Munch – Started in 1903 as a society to promote the study of history and ended in 1919. Its collection of 125 books focusing on history, especially of the Scandinavian countries, was given to the library in 1920. American newspapers and magazines were contributed to the library by the literary societies Niffelheim (1874-1889) and Muspelheim (1879-1932). Muspelheim especially was known for furnishing daily, weekly and monthly periodicals to the library. In addition, these and many other societies produced their own publications which have been preserved in the Luther College Archives. Books and periodicals were transferred to the library from other sources as well. The library of approximately 2,000 titles originally acquired by the Luther College museum was recommended for transfer to the College by the faculty in 1921 and approved by the Board of Trustees. This collection contained many books by Norwegian-American authors and publishers. Eventually Norwegian-American newspapers and magazines held by the museum were also transferred to the college library. 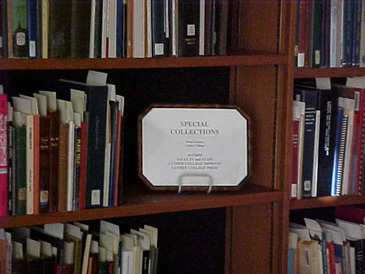 Preus Library has several substantial collections which were donated directly or indirectly by individuals whose names are used to designate the collection. Examples of large collections received during the early years of the College are the Bishop Bang Collection of 5,000 books that was donated to the College in 1913 and the Haldor Hanson Collection of 3,000 books and periodicals which the College received in 1930. Smaller collections were donated by the following individuals: Knut Gjerset, who gave many books to the library during his tenure at the College, but especially between 1922 and 1936; J.C.M. Hanson, ’82, who gave donations starting in 1923, culminating in a bequest and endowment after his death in 1943; Margaret Metcalf Howie who provided a collection in 1976 in memory of Dr. George S. Metcalf, Ernest M. Espelie, ’31, who donated books during the years 1980-1983; William A. Heintz whose bequest was received by the library in 1997.